Birthday wishes for Mother-in-Law: Not all mothers-in-law are as vicious and monstrous as they are made out to be in movies and books. If you respect and love your mother-in-law just like your own mom, communicate your feelings to her. Wish her an awesome birthday by sending a greeting card along with a thoughtfully selected gift. Write down a heartfelt message inside the card to tell her how much respect her. Make her day memorable by throwing her a surprise party at your place where she can spend time with family and friends. If you share a warm relationship with her, post a funny quote or a cute selfie of you both on Facebook. Let your sweet gestures convince her that you hold her in high regard and love her unconditionally. 1) Your gift to me was giving birth to the man of my dreams. 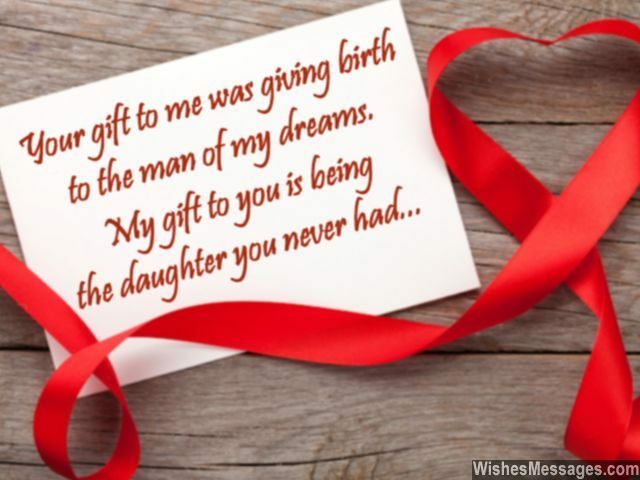 My gift to you is being the daughter you never had. Happy birthday. 5) With a beautiful mother-in-law like you, it’s no surprise that my wife is such a pretty woman too. Happy birthday. 6) Happy birthday to the lady who has been more of a mother to me and less of an in-law. 8) I don’t know how to write birthday wishes for a mother-in-law because you’ve never behaved like one. Happy birthday mom. 9) Cold and manipulative mothers-in-law most people have seen, but warm and caring is what mine has been. Happy birthday. 10) I love making my other married friends jealous by flaunting a cool mom-in-law like you. Happy birthday. 11) If every woman had a terrific mother-in-law like you, every woman in this world would have an amazing second mom too. Happy birthday. 12) I’ve always seen you as my mom and you’ve always seen me as my son. We are a pair that’s one in a million. Happy birthday mom. 13) Misunderstandings, difference in opinions and disagreements – neither of these have enough power to create a wall between us. Happy birthday. 14) My marriage didn’t just give me a second home, but also a second mom. Happy birthday. 15) Vicious mothers-in-law are many, caring ones are few. I feel so lucky to have an amazing mom-in-law like you. Happy birthday. 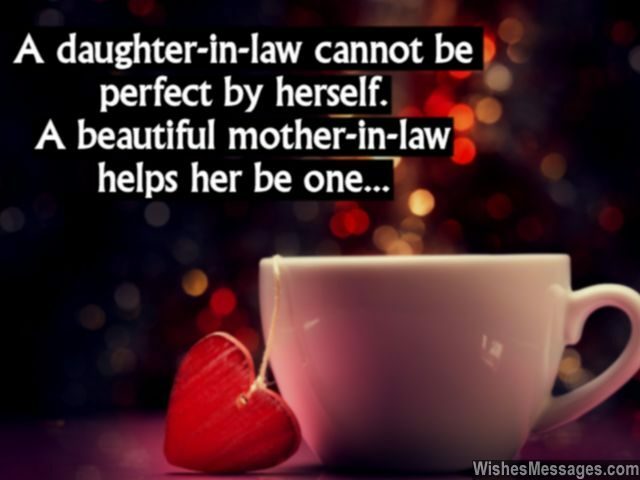 16) A daughter-in-law cannot be perfect by herself. A beautiful mother-in-law helps her be one. Happy birthday. 17) We don’t just enjoy having you over for dinner, we wish you would stay with us forever. Happy birthday. 18) Crazy mothers-in-law are a myth, for mine is a beautiful reality. Happy birthday. 19) An amazing husband to support me and a lovely mother-in-law to understand me – my marriage made both my wishes come true. Happy birthday. 20) You’re my new best friend after marriage. Happy birthday. 21) Your daughter is not the only person who loves you the most in the world. I am competing with her. Happy birthday. 22) Raising kids would have been a disaster if I didn’t have a mom-in-law like you to save me from making blunders. Happy birthday. 23) Rearing a child, managing a family, achieving professional success and being a wonderful person – you’re my role model for everything. Happy birthday. 24) An amazing husband like mine can only be the son of a fantastic mother like you. Happy birthday. 25) If you are so extraordinary as a mother-in-law, I can’t even imagine how amazing you would be as a mother. Happy birthday mom. 26) You’re not my mom-in-law, you’re the mom-who-I-am-in-love-with. Happy birthday. 27) Technically we may be in-laws but for all other practical purposes, we are BFFs. Happy birthday. 28) I don’t know what I did to deserve an awesome mother-in-law like you, just like how you don’t know what you did to deserve an amazing daughter-in-law like me. Happy birthday. 29) We may be in-laws, but a great chemistry we share. Just like a mother and daughter, we make an awesome pair. Happy birthday. 30) My marriage is a match made in heaven because I got the perfect husband and awesome in-laws. Happy birthday. 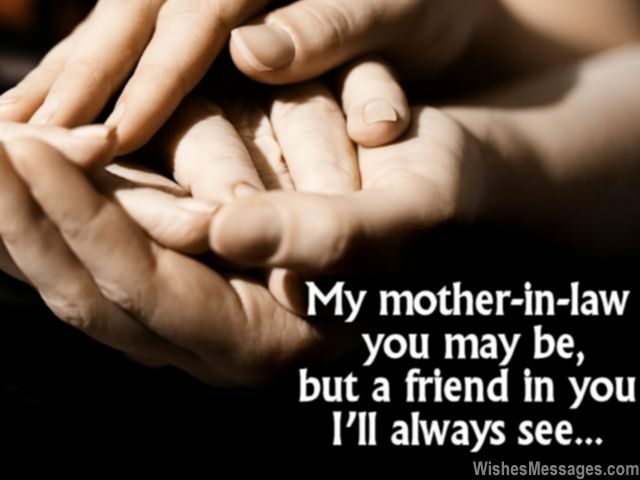 31) My mother-in-law you may be, but a friend in you I’ll always see. Happy birthday. 32) You gave me the most amazing gift in the form of your daughter. Allow me to return the favor by becoming your loving son. Happy birthday. 33) When the foundation of our family is a mother-in-law like you, no force in the world can shake us. Happy birthday. 34) Bad vibes, malicious jibes, nasty arguments and tense moments – our relationship is way too precious for these petty things. Happy birthday. 35) Life has given me many reasons to be happy, thankful and grateful – one of them is you. Happy birthday mom. 36) Whether it’s my home, kids or career – for supporting me, I know you’ll always be here. Happy birthday. 37) My friends miss me when they go out shopping, because I’ve found my new best friend in you. Happy birthday. 38) A ruby necklace, diamond earrings, gold bracelet… I just couldn’t find a gift as precious as you. Happy birthday mom. 39) Mothers-in-law are usually painted in bad light. But you are the light that has shown our family the right way. Happy birthday. 40) Happy birthday to the queen bee, without whom we’d be an incomplete family. Happy birthday.